Children are one of the largest new user groups of mobile technology -- from phones to micro-laptops to electronic toys. These products are both lauded and criticized, especially when it comes to their role in education and learning. The need has never been greater to understand how these technologies are being designed and to evaluate their impact worldwide. Mobile Technology for Children brings together contributions from leaders in industry, non-profit organizations, and academia to offer practical solutions for the design and the future of mobile technology for children. industry professionals - industrial designers, software or web interaction/interface designers, ubiquitous computing designers, mobile application designers, developers working in mobile media, project/product managers, professionals who currently develop technologies for children (e.g., at toy companies, software developers, media companies, and more) and would like to move into the mobile area. Allison Druin is assistant professor at the University of Maryland, both in the Institute for Advanced Computer Studies and the College of Education in the Department of Human Development. Her recent work has focused on developing-with children as her design partners-new robotic storytelling technologies. 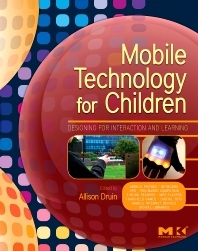 Druin is the editor of The Design of Children's Technology and coauthor of Designing Multimedia Environments for Children (John Wiley & Sons, 1996).